Chanteuse María Jimena has been delighting audiences in Puerto since 2007 with her cabaret performances of classics from the American songbook, like Summertime and other show tunes, to La Vie en Rose, as well as traditional and contemporary songs from Mexico, Spain, South America and the Caribbean. 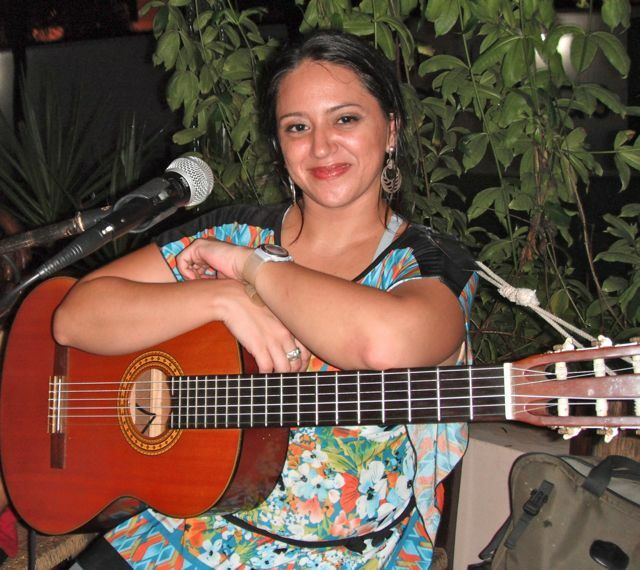 You can hear Jimena, with David Rangel on bongos every Saturday night from 9-12 at Olas Altas on Zicatela. 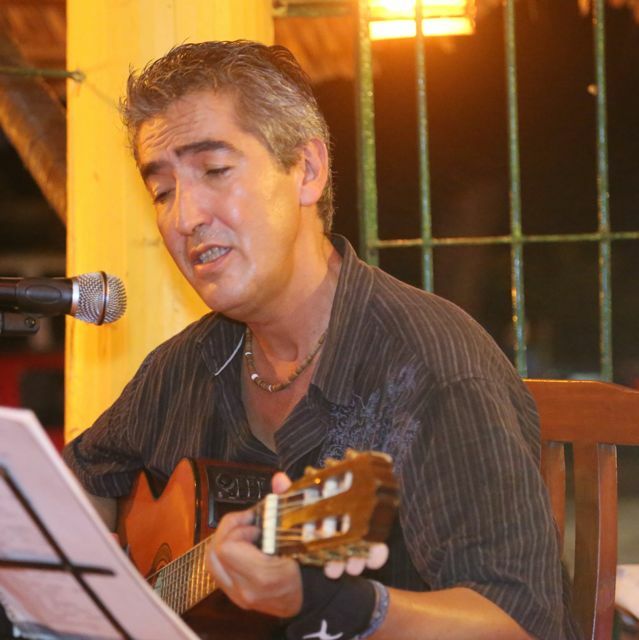 Virtuoso guitarist, violinist and singer, Neto Garcia, is performing at Mangos on Zicatela six nights a week from 8-11. His wide repertoire encompasses Mexican folk music, trova, and the romantic songs of Álvaro Carrillo, Agustín Lara and José Alfredo Jiménez as well as contemporary numbers and traditional music from the Caribbean. Neto is sometimes accompanied by Mayca on vocals and Benjamin on Sax. Neto, whose roots are in Aguascalientes, was born into a musical family. His father was a mariachi who performed in the films of Pedro Infante, Jorge Negrete and Lola Beltrán. Besides being an accomplished violinist, composer and arranger, Neto has dedicated himself to studying and reviving the traditional music of Veracruz and the Costa Chica. In 2013, he was awarded the Epromúsica prize by FONCA (National Fund for Culture and Arts) for his work in this area with the Tapacamino Music Collective. Neto has also dedicated himself to music for children. In September he participated, with Pepe Frank, at the Conference for Latin American Children’s Songs in Bogotá. 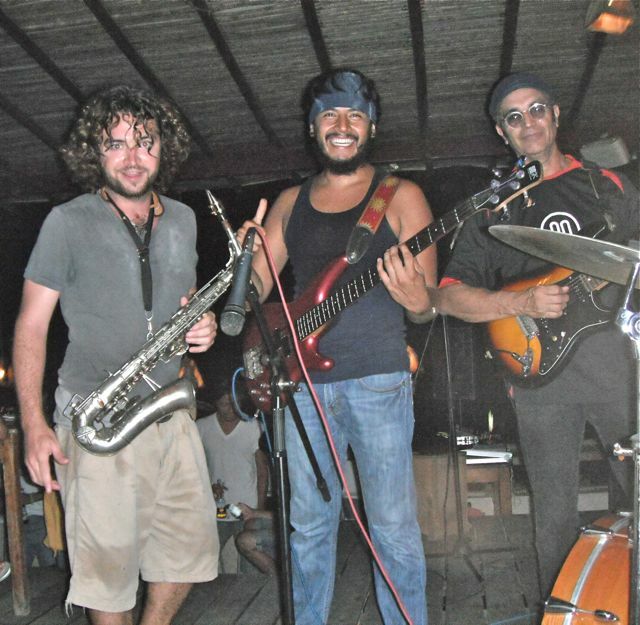 There is no limit to the musical genres of No Limits a group featuring Benjamin on sax, vocalist and bass guitarist Vicente “El Diablo”, lead guitarist Mario García, and Paul Lye on drums. Their mix of jazz, funk, disco, Latin and rock and their own original compositions is nothing short of awesome. Take, for example, their rendition of Coltrane’s Afro Blue mixed with Alingo lingo by Pepe Ramos, the King of Chilenas. The group’s high energy is matched by its high quality musicianship. Veteran guitarist, Marío Garcia played with such notables as Luis Miguel and Yury. Vicente “El Diablo” started playing traditional Mexican music at a young age and then got into rock and other genres when studying at the Fermatta Music Academy in Mexico City. Benjamin studied jazz and classical music at the McGill University Conservatory of Music in Montreal. Drummer Paul Lye, a long-time fixture on the Puerto rock scene, now gets to display his skill at Latin beats too. They perform at 11 pm on alternate Fridays at Sativa and alternate Saturday’s at Casa Babylon on Zicatela. For future venues go to Facebook No Limits Band International.